The Apprenticeship levy is designed to create and fund three million Apprenticeship starts by 2020. The levy, set at 0.5% of an employer’s overall salary bill, is to be collected through PAYE from April 2017. It will be payable by any company with a salary bill of £3 million per annum or more, with an offset allowance of £15,000. In real terms, this means 98% of employers will pay nothing at all. The levy will be collected from all employers by HMRC and placed into the Apprenticeship Funding pot. The only way that you can then utilise this money is by offering Apprenticeship training to new or existing staff. The funding will be paid directly from the pot to the training provider that you use for your training. Employers falling under the levy payment threshold can still take on apprentices and will be able to access government support and funding for the apprentice (subject to eligibility). If you are unsure whether your organisation will be required to pay the levy, click here and use our handy levy calculator. The only information you need is your overall wage bill total. How should my organisation prepare? 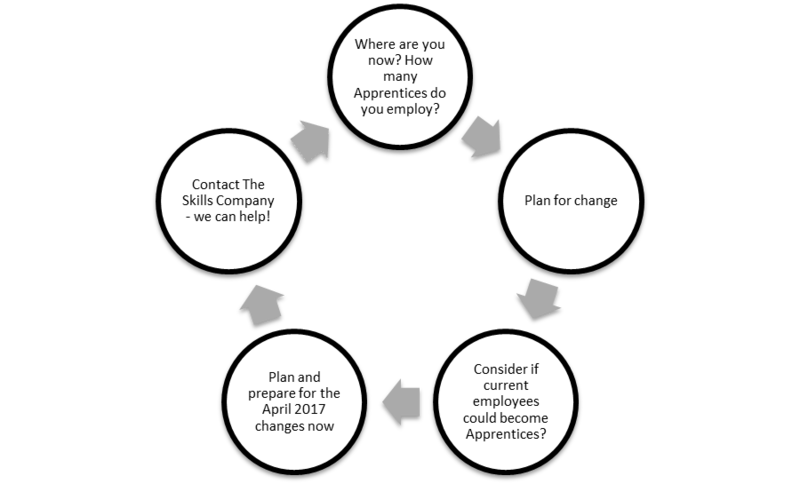 1) Assess your current situation - how many employees are Apprentices? How many more will you need and what are they doing? 2) When April 2017 arrives, your levy monies will only be useable on the new Apprenticeship Standards. Be aware of these as well as other legislative changes. 3) The Skills Company are already delivering the new standards in areas such as Electrical. The good news is current staff can become Apprentices under these standards, they don't need to be new recruits, so consider how Apprenticeships can be used as a way to develop existing employees. 4) Start your planning now, so you are fully prepared and ready to claim 100% of your levy in April 2017. 5) Don't muddle through alone. This is a complicated area and we can help! Contact us on the details below for more information, advice and guidance.